Even though "silver fillings" are economical, very strong, and have lasted for many years on the back teeth, you may have a cosmetic alternative to those "silver filling" that show when you smile. A conservative alternative is a composite resin "white filling" that are now being used to restore the smaller cavities. 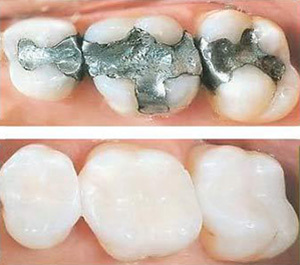 A natural, tooth colored material is used, where many times you can not tell you have had a filling done. A special light is used to harden the material so you may begin chewing immediately after the treatment is completed. Usually this restoration can be completed in one visit. Other alternatives for cosmetic back fillings are porcelain inlays, porcelain onlays, and porcelain Crowns. These may require more than one appointment since our Master Lab Technician must be used to fabricate these restorations. Ask Dr. Martinez what restoration would be best for you!